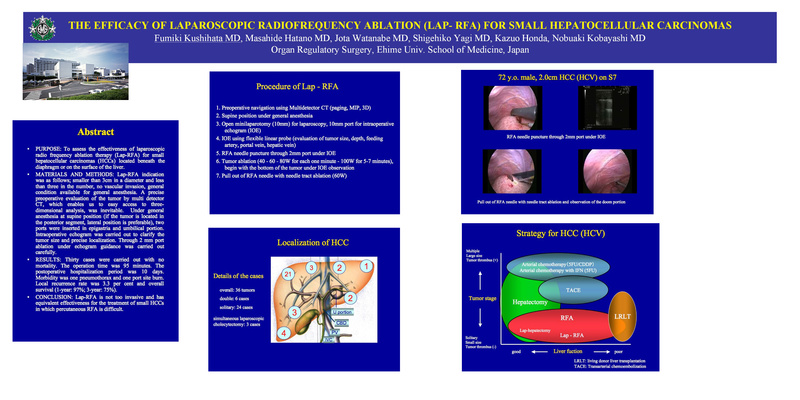 PURPOSE: To assess the effectiveness of laparoscopic radio frequency ablation therapy (Lap-RFA) for small hepatocellular carcinomas (HCCs) located beneath the diaphragm or on the surface of the liver. MATERIALS AND METHODS: Lap-RFA indication was as follows; smaller than 3cm in a diameter and less than three in the number, no vascular invasion, general condition available for general anesthesia. A precise preoperative evaluation of the tumor by multi detector CT, which enables us to easy access to three-dimensional analysis, was inevitable. Under general anesthesia at supine position (if the tumor is located in the posterior segment, lateral position is preferable), two ports were inserted in epigastria and umbilical portion. Intraoperative echogram was carried out to clarify the tumor size and precise localization. Through 2 mm port ablation under echogram guidance was carried out carefully. RESULTS: Thirty cases were carried out with no mortality. The operation time was 95 minutes. The postoperative hospitalization period was 10 days. Morbidity was one pneumothorax and one port site burn. Local recurrence rate was 3.3 per cent and overall survival (1-year: 97%; 3-year: 75%). CONCLUSION: Lap-RFA is not too invasive and has equivalent effectiveness for the treatment of small HCCs in which percutaneous RFA is difficult.